"Most festive" London pub decorated with more than 21,500 Christmas lights. 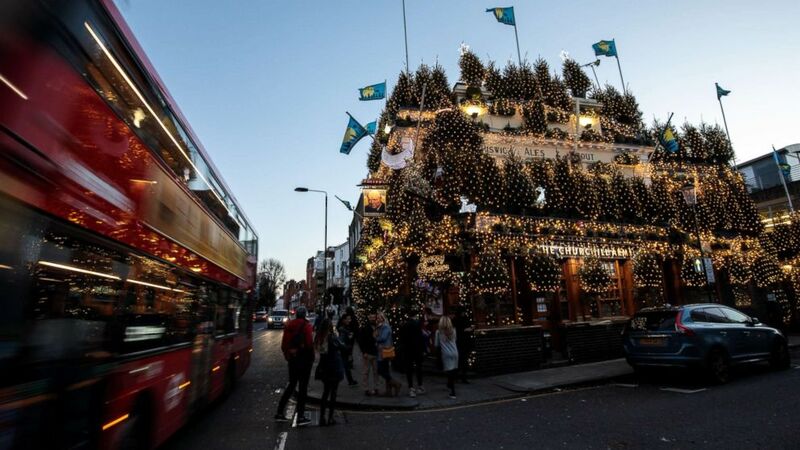 The Churchill Arms' 3-story display of nearly 100 trees and more than 21,500 Christmas lights in London has earned it the title of "most festive pub" in the United Kingdom. The Kensington bar was widely recognized by Esquire, ITV News and Time Out London, among others, with the honor. “It’s the most amazing scene, isn’t it? When you come and see a pub that is entirely covered in Christmas lights. There’s no place like it,” manager James Keogh told ABC News. Keogh said it took them three weeks to put up the 97 trees and the thousands of Christmas lights this year, keeping the 26-year tradition of decorating the façade of the pub. When they first started the tradition, the exterior only hosted 10 trees, Keogh said. “It’s such an impression made on the pub and, from the people’s expressions and comments, that we just have to carry on with more trees,” he added. (Jack Taylor/Getty Images) The Churchill Arms pub in London stands adorned with Christmas lights and conifer trees for the Christmas period, Nov. 30, 2018. The Churchill Arms had already been named one the most Instagrammable pubs by the Evening Standard for its Chelsea Flower Show display earlier this year. Built in 1750, it was already famous for being one of the oldest pubs in London. “I think it’s absolutely amazing. It’s 3 stories of Christmas trees, which, obviously, you can’t miss from a mile away,” Henry Baines, a customer at the Churchill Arms, told ABC News. Keogh said the pub is planning to take their decorations to the next level in 2019 -- this time with 22,500 lights, 100 Christmas trees and even a small train that will drive through the building’s façade.